Americans overwhelmingly see obesity as a very serious public health problem, one with consequences not just for individuals but society as a whole, a new Pew Research Center report finds. But just who is obese? Research on obesity and socioeconomic status from the Centers for Disease Control and Prevention throws a few twists into the common wisdom that, in the U.S. at least, obesity is primarily a disease of the poor. Public health researchers define obesity, and overweight more generally, in terms of body mass index (BMI). A person’s BMI is his or her weight (in kilograms) divided by the square of his or her height (in meters), rounded to one decimal place. A BMI of 25 or more is considered overweight; 30 or more is considered obese. As we first reported back in 2006, Americans appear to have a sliding scale (so to speak) when it comes to weight, consistently underestimating their own relative to others’. For instance, only 31% of people surveyed by Pew Research earlier this month said they were overweight; most of those said they were “somewhat” or “only a little” overweight, while 63% termed their weight “just about right.” But according to the CDC, 68% of Americans are overweight, and more than a third are obese. The CDC data come from the National Health and Nutrition Examination Survey, an ongoing program of studies that combines interviews with standardized physical exams, including height and weight measurements. 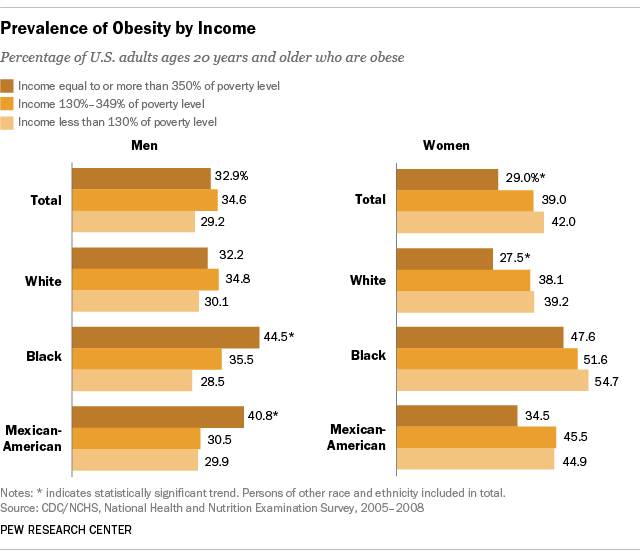 Obesity varies considerably depending on gender, race, ethnicity and socioeconomic factors. In 2010, CDC researchers (using data from 2005-08) found that among black and Mexican-American men, obesity increased with income: 44.5% and 40.8% of those men are obese, respectively, at the highest income level, compared with 28.5% and 29.9% at the lowest level. Beyond that, though, the researchers found little correlation between obesity prevalence among men and either income or education. After rising sharply in the 1980s and 1990s, obesity rates in the U.S. appear to have mostly leveled off in recent years. More than a third (34.9%) of U.S. adults, or 78.6 million, were obese in 2011-12, according to government data — not significantly different from the 35.7% obesity rate found in 2009-10 or the 34.2% rate found in 2007-08. 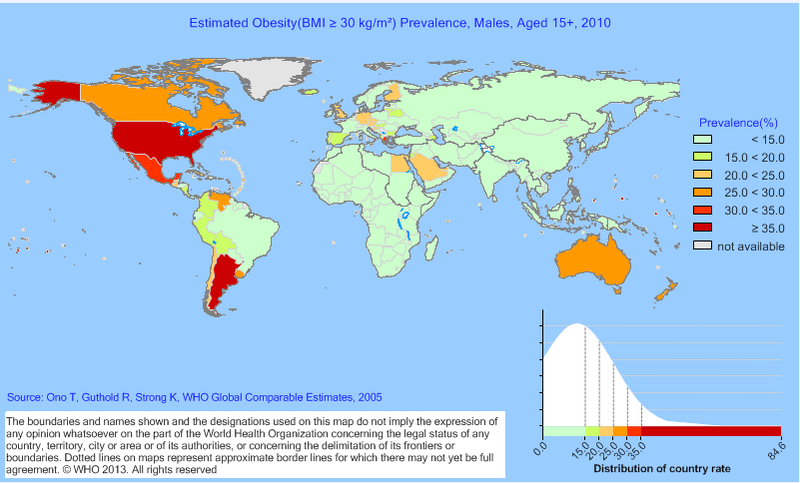 Globally, obesity is overwhelmingly a problem of developed rather than developing nations, and in few places more than in the United States. Using 2010 data, the World Health Organization estimated that 44.2% of U.S. males and 48.3% of U.S. females aged 15 and above were obese.